History tells us that it has not always been easy for one to return to the earth at a place where you were given life, especially in fertile lands. Conflicts between the tribes often expelled the defeated inhabitants to the other (often sterile) areas. Bessarabia and northern Bukovina (Nordbuchenland) is a triangle region bordered by the two rivers Dniestr and Purt (today Moldova and districts of Ukraine). and adjacent to the beautiful Black Sea, In early 19th century, farmers from Germany started to settle in this agriculturally rich region (magenta area on this map shows german colonies). This article is about the destiny of these farmers during World War II. Since 1812, Bessarabia had been ruled by the Russian Empire, but a greater portion of the population was Romanian. After the World War, Rumania successfully seized this area. This new situation did not last long. The two dictators, Hitler and Stalin, started World War II by dividing Poland into two. One of Stalin's next targets was to take Bessarabia back into Russian hands. This had already been agreed in secrecy between Molotov and Ribbentrop when the Russo-German nonagression pact was signed. In June 1940, Soviet troops invaded Bessarabia. Romanian troops withdrawn over Purt river. After the invasion, Hitler wanted ethnic german population to be resettled in the conquered Poland, thus started "Umsiedlung" (resettlement) operation. On September 5th, Soviet and Germany agreed to resettle ethnic german population in the Reich. Though farmers had choice whether to move or not, but due to the terror of communist Soviets, most of the ethnic german population (93,000) agreed to move. 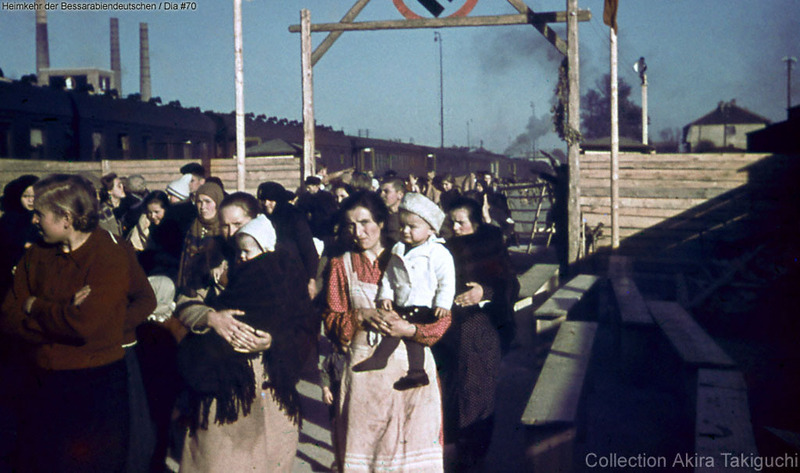 This resettlement procedure was called Heimkehr der Bessarabiandeutschen (Bessarabian-german returns home). On September 15th, 600 Umsiedlungskommando (resettlement commandos) arrived in Bessarabia. Most members were from Allgemeine-SS. The troops immediately announced the procedure of resettlement. The farmers had to fill the forms to prove their origin and what they had at home, so that the value of property of these farmers could be reclaimed from Soviets.